In the interests of blogging the unblogged, I'll keep this brief. Than it took to sew it? 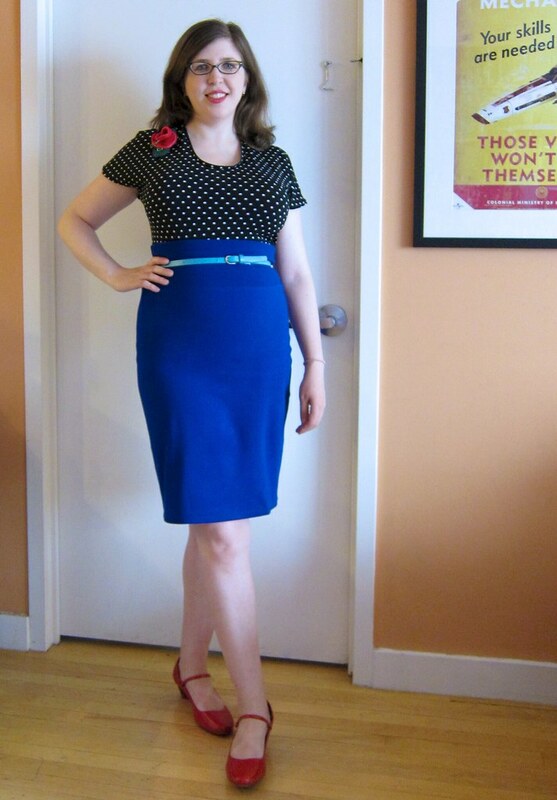 Pattern: Burdastyle Melissa high-waisted knit pencil skirt. It doesn't get any simpler than this dartless, three-piece (front, back, waistband) PDF pattern, a mere $3.99. 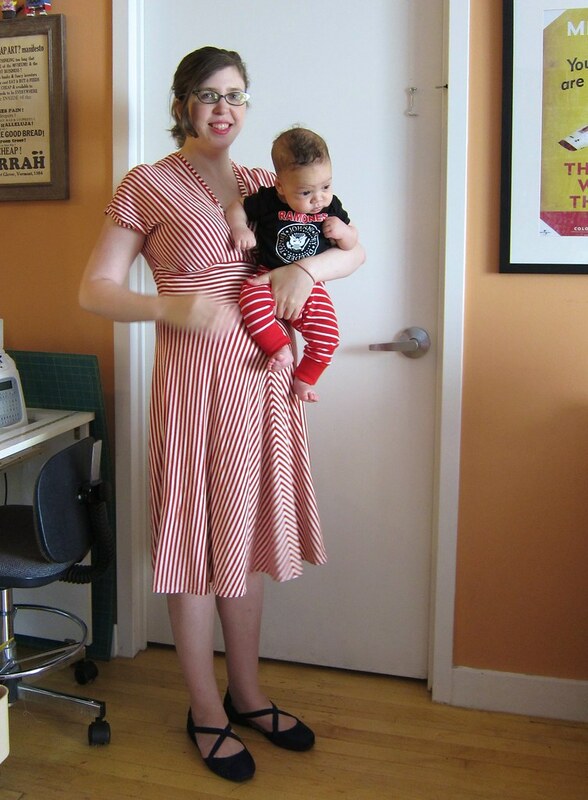 I've made this before in a red knit maternity version and a sparkly spandex mermaid version, but this is my first really wearable useful version. Fabric: Bright blue ponte doubleknit rayon/poly/lycra, I think, from Mood a long time ago. A stash-busting win! As noted above I had made this skirt five years ago in a red single jersey but it was too clingy and thin — this is a much more substantial and appropriate material for a tight-fitting skirt. Notions: None — it's an elastic-free waistband. 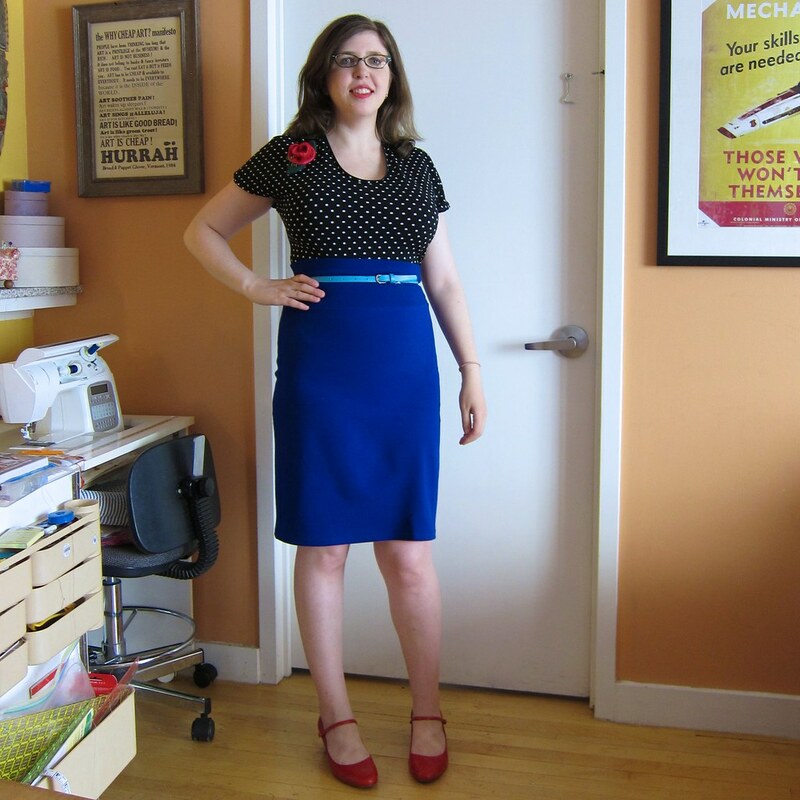 Sizing: I cut a straight size 38, which corresponds to almost two sizes smaller than my actual measurements. 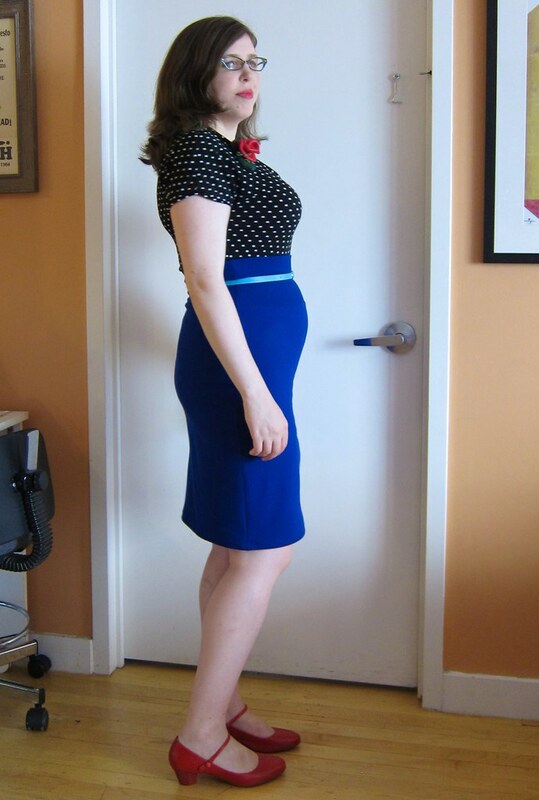 It's slightly snug, but I'm still slowly changing size in a downward direction almost four months out from giving birth to little D, so I'm sewing at a moving target. How I found the time: This required just one baby catnap (for cutting time) and one short late-night sewing session after baby was asleep. Anyway, even in my sleep-deprived time-pressed state, it was a quick sew. I basted the sides to check fit (better than unpicking serger seams later! ), serged it and hemmed it with a stretch twin needle. No modifications needed. I'm trying to get back to twin needle hems after backing away from them in frustration and resorting to zig-zags for a while... this hem actually popped the first day I sewed it, but I redid it after playing with tension and putting wooly nylon in the bobbin and it's holding up much better. Me-Made-May gave me the extra push I needed to hem this thing... but baby pooped all over it while we were taking this photo, so I'm still trying to sun the stains out. 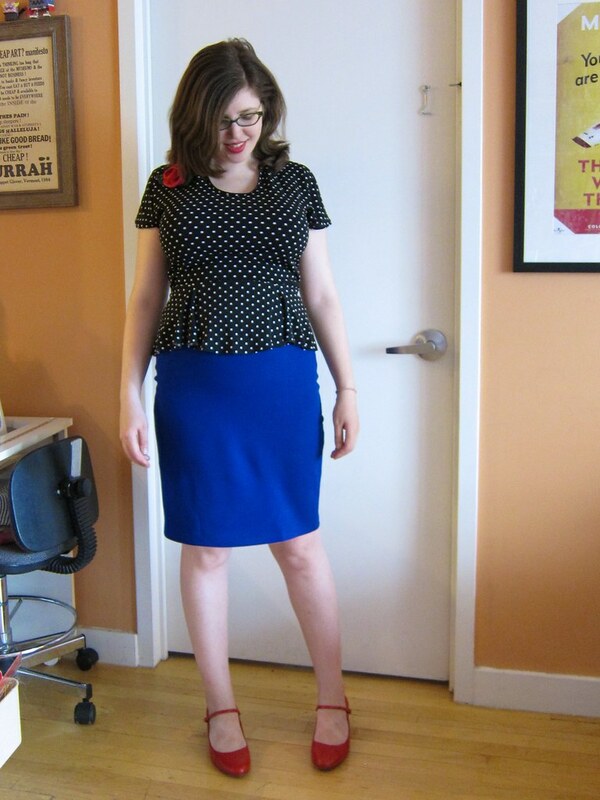 So yes: another fitted blue skirt. Not as playground-worthy as the stretch denim trumpet skirt I just made, but I go back to work in less than two weeks and I needed some versatile basics. It also made a perfect date night skirt for when my parents watched the kids and husband and I went to see the Avengers movie (eh, it was OK... not my favorite Whedon thing). Will I make this pattern again? Probably, though I'm tempted to do something to it to keep it interesting — add some seaming or a flounce, or use a bold print. I like twin needling! Although sometimes I do finish an object, walk away, and hem it the next day. I actually HAVE a babylock. My grandma gave me hers because she wasn't using it anymore. I HATE it. It's so temperamental, and has trouble detaching at the end so my hems end up overlapping and being wonky. Maybe it's just user error but I'm going to stick with my twin needle, which works fine and doesn't need a special threading technique. I've also used zigzags when I didn't have a twin needle. Imo they work fine, although they look slightly less neat. And they aren't very good on lighter fabrics, they tend to go wibbly. I don't use fusible tricot or wonder under when twin needle hemming on all but the thinnest knits. I lower the tension on my needle (from 4 to 2 on my Bernina), then I lower the presser foot pressure (from ~40 to 25-30). Then no rippling or tunneling. Tissue knits need some support, but a ponte should be fine with this technique. I don't have a twin needle so its zigzag for me. Love the colour of this skirt. So bright and cheerful. I'm also team zigzag, mostly because every attempt I've ever made at using a twin needle was a horrible tangled fail. I just keep the stitches long and narrow so it looks as straight as possible while still having the stretch. Why do they break so easily?! I didn't mention that, but I had JUST bought a new one and I broke it going over the thick part where the seams intersect, and I wasn't even sewing too quickly or anything. Oh man, those twin needle fails...I always get really hopeful that maybe *this* time it will work, and then it tunnels and looks stupid, then I resolve never to do it again, but then time goes by and I forget, and then the whole cycle starts all over again. I have had some limited luck with steam-a-seam, but I'm going to have to try that wooly nylon thing. That skirt is a brilliant color on you, btw! And your accessories look just fine to me. Ok, how do you get the woolly nylon on the bobbin? Do you hand-wind it? The spool is so large. Or is this a silly question? Great skirt. Ponte is the best...smooth, stretchy, form fitting with comfort! I love my twin needle. I stopped interfacing my hems unless it's a really fussy knit that won't press and I don't have much trouble with the twin needle. I do love wooly nylon in the bobbin, but I've started not ALWAYS using it. If it's a darker fabric, or especially, if I'm sewing something casual for my kids, I have no qualms about using a zigzag. I like zigzag hems on sleeves. My theory is if your stitching quality is good, it doesn't matter what exact stitch you're using.